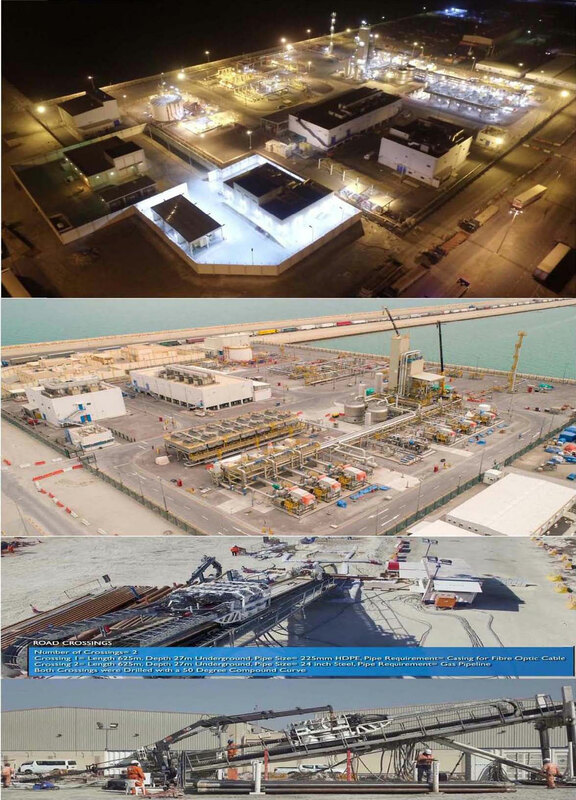 The Liquefied Natural Gas Import Terminal (LNGIT) forms a vital part of Bahrain's energy infrastructure as it provides the Kingdom with a secure supply of Liquefied Natural Gas to meet the growth in demand for Natural Gas in order to fuel large industrial projects, to generate power and water, and for enhanced oil recovery. The Project includes an offshore facility linked to shore by underwater and surface pipelines. Onshore infrastructure includes a gas receiving plant and a nitrogen production facility and has a production capacity of 800 million standard cubic feet a day. GS E&C was the EPC Contractor and the construction was awarded to MCSC. The scope of work for this project includes Civil, Building, Structural, Mechanical, Piping, Pipeline, Horizontal Directional Drilling (HDD) for Underground Pipeline Section, Electrical, Instrumentation, Painting, Insulation, Fire-Proofing including Pre-commissioning & Commissioning assistance works and the scope also includes Design and Construction of one Fire Water Storage Tank of 13M Dia. x 8M height with 1,000 M3 Capacity. As a part of Pipeline Erection, Horizontal Directional Drilling (HDD) work has been carried out to install the underground section of Gas lines from LNG. The Hole was drilled at 27 M deep with a total length of 625 M and the work was given to NSCC, UAE. Asphalting & Paving Works: 9,710 Sq. M.
Piping Welding: 62,871 Inch Dia. Pipeline Works: 7,128 Inch Dia. HDPE Pipeline: 456 Inch Dia. Area Painted: 13,283 Sq. M.
Electrical Cable Layed: 120,617 M.
Instrumentation Cable Layed: 79,062 M.
Fibre Optic Cable Layed: 16,065 M.